We recommend that pool water be tested regularly throughout the swimming season to detect potential problems. This enables you to be aware of any balancing and treatment adjustments needed before a problem becomes serious. 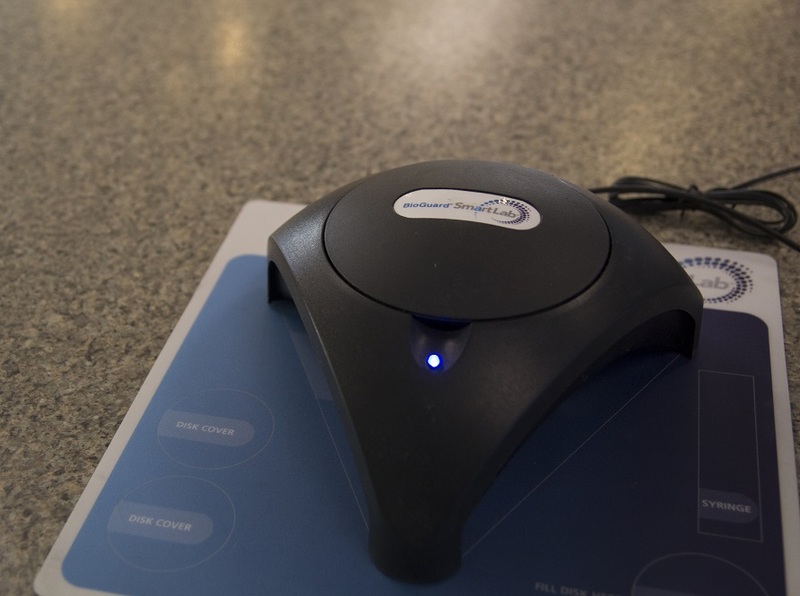 Our BioGuard SmartLab computerized water test station is the most accurate in the industry, quick and easy. The test strip reader provides the best technology for testing water with fast, accurate results. By using technology originally developed for the medical industry, SmartLab accurately measures free chlorine, total chlorine and bromine residuals, total alkalinity, borates, calcium hardness, cyanuric acid, biguanide, hydrogen peroxide and copper and iron. These are all the tests that should be run to keep your pool ready for swimming when you are. SmartLab provides a very detailed report of your pool water status and what adjustments need to be made to keep your water in balance and your pool looking and feeling great. Most people falsely assume that clear water means the water is free of bacteria, swimmer residue and algae. This is not so. You should make sure that the pool water has the proper amount of sanitizer and is balanced throughout the swimming season. Testing at least once a month is what we suggest. You should also test at home on a weekly basis. Start with a clean, glass or plastic bottle — that is, make sure whatever was in the bottle has been rinsed out and that no soap residue is present. Simply rinse with warm water to loosen product, dirt, etc. Invert the bottle (mouth down) and push down into the pool or spa about 8-10 inches. Then turn the bottle upright to fill. This way, you’ll collect water without any surface contaminants in a bottle that has minimal other contaminants. Cap and bring to the store as soon as you can (no rush, but don’t leave it sitting in the sun which could break-down some chemicals prior to testing. Be prepared to tell us what products you use in your pool and the most recent applications you’ve made and when.